A ‘super long’ e-scooter featured in a video gone viral in Singapore was finally impounded by the officers of Land Transport Authority (LTA) today. The ‘super long’ e-scooter is in fact a personal mobility device (PMD), which has the length of a car. 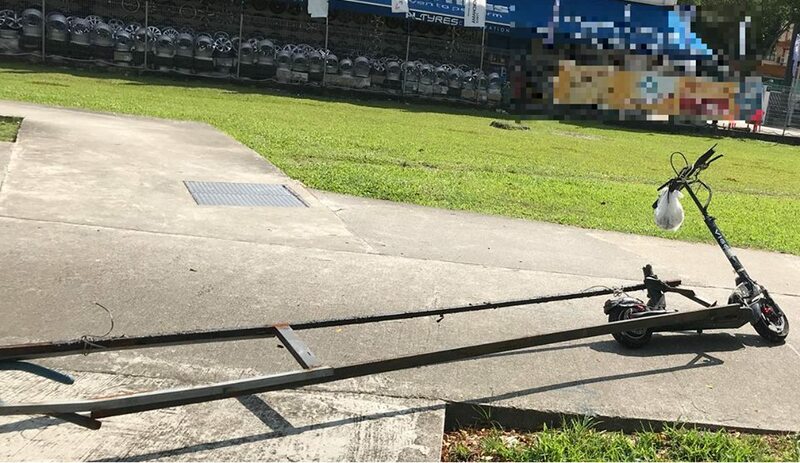 LTA authorities found out that the e-scooter had exceeded the permissible weight of 20kg, which disqualified it from being used on public paths. Riding a PMD on the road is also illegal. The video of the e-scooter has gone viral in the country. It was first uploaded on the ROADS.sg Facebook page on Oct 20, where its owner was spotted riding it near the Certis CISCO centre at Jalan Afifi. LTA has warned that heavy penalties such as fines and/or imprisonment can be incurred from offences such as reckless riding, flouting of speed limits, use of non-compliant devices, and riding devices on the wrong paths. People of Singapore can find more about PMD regulations and rules of conduct on LTA’s website.